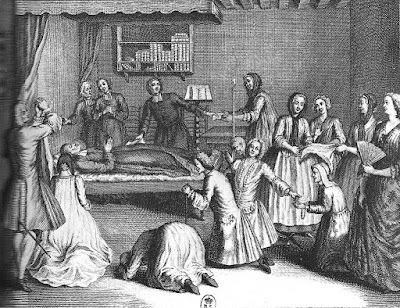 In the late 1720s and early 1730s the tomb of a humble deacon in the church of Saint-Médard was the scene of extraordinary miracles of healing. The happenings are complex to unravel and even more difficult to explain; I thought I would ask the basic question: what is known about the diacre Pâris himself? 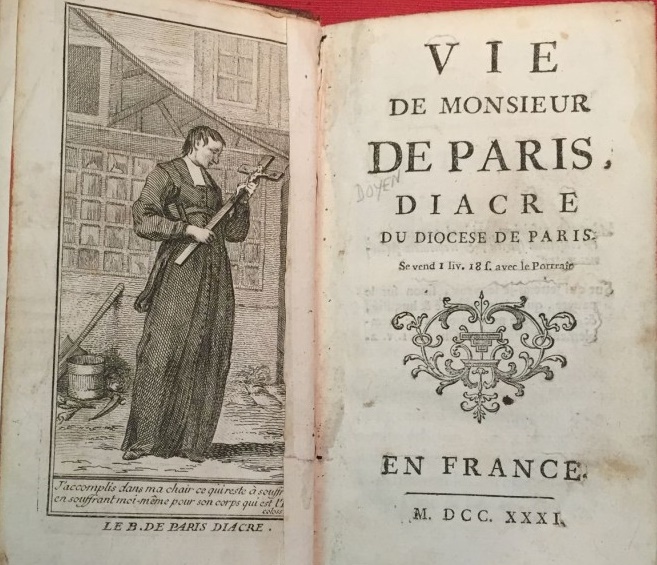 Accessible details of the life of François de Pâris come almost exclusively from three popular biographies which were sold in the streets of Paris from 1731 onwards. 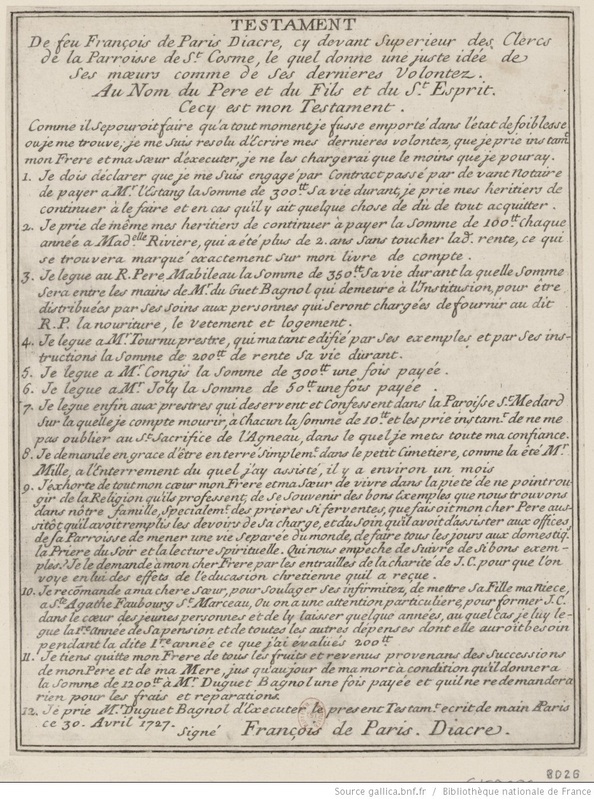 According to the preface to the first (attributed to Pierre Boyer) the documentation had initially been gathered in support of Archbishop Noailles's abortive move to instigate the diacre's canonisation, As such they are essentially hagiographies, intended primarily to establish the fama sanctatis of the candidate. From 1731, as the miracles performed in his name increased, new editions of the texts amplified the deacon's status as a "holy martyr" of the Jansenist cause. However, modern historians have also found corroborating evidence from archival sources. François de Pâris was born on 30th June 1690, into a family of the noblesse de robe originating from Champagne. The family had moved to Paris at the time of the deacon's grandfather and in 1684 his father Nicolas had achieved the exalted position of conseiller in the Parlement of Paris. His background was not particularly devout, though there were ties to the Jansenist magistracy of the capital; the deacon's maternal uncle and executor of his father's will was Jérôme Le Féron, sous-doyen of the Grand’Chambre, whose sister had been a nun at Port-Royal. François entered the Church in the face of parental opposition since, as the eldest son, he was intended to follow his father into the legal profession. In 1713 having finished his license-en-droit he was finally allowed to enter the seminary of Saint-Magloire. According to his biographers he had from the first demonstrated a predisposition for the religious life, giving himself over to frequent mortification, exercises of piety and solitary prayer. We are told that in the previous year he had been disfigured by smallpox which he took as a sign to leave worldly vanities; it was said that he later thanked God for the affliction. 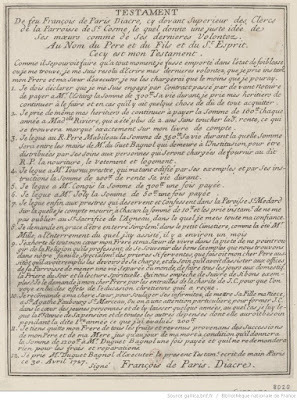 On his death in March 1714 Nicolas de Pâris partly disinherited François in favour of his younger son Jérôme-Nicolas, who now embarked upon a legal career in his stead. The biographies relate that the future saint converted his share of the inheritance, which consisted mainly of furniture and silverware, into alms for the poor. Nonetheless the settlement left him adequately provided for: besides half his mother's goods, he retained a quarter of the income from his father's estate - amounting to several thousand livres a year. Jérôme-Nicolas was received into the Parlement in 1717 and married a wealthy heiress. He features in the margins of the biographies as his brother's admiring supporter. François's deepening personal commitment clearly coincided with the widening crisis within the Church. At Saint-Magloire he entered definitively into the circle of the Jansenist figurists, attending the conferences of the abbé d'Asfeld at Saint-Roch. He also made the acquaintance of the prominent appellant bishop Jean Soanen of Senez. In 1714 at the age of twenty-four the future deacon produced a "Compendium of theology" which expressed his adherence to the Jansenist tenets of predestination and efficacious Grace, as well as confirming his convinced Gallicanism. In 1717, and again in 1720, he was numbered among the appellants. 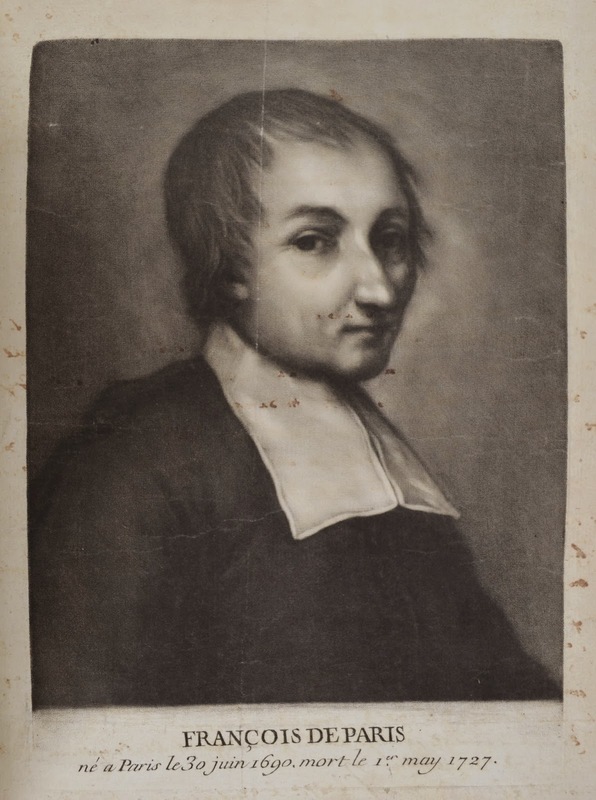 François de Pâris never wavered in his opposition to Unigenitus. His final profession of faith dictated on his deathbed denounced the Bull as "the work of the devil" and called upon the faithful to promulgate Jansenist authors, particularly the solitaires of Port-Royal. His biographers emphasise that the deacon always considered himself unworthy of clerical office and eschewed all positions of authority. Nonetheless there was at first some question of a conventional ecclesiastical career. He took Minor Orders in 1715 and, having left Saint-Magloire in 1717, was ordained a subdeacon in 1718. In 1718 also he was refused a position as canon at the Cathedral in Reims due to his Jansenist views. He now took up lodgings close to the College de Bayeux, another Jansenist stronghold. In 1720 he reluctantly consented to ordination as deacon, but resisted pressure - from Archbishop Noailles himself - to become parish priest at St-Côme where he assisted. Perhaps only at this point was he definitively deflected into the ascetic life. At the beginning of 1723 he sold his country house, acquired in 1719 in the village of Palaiseau, the final resting place of the Arnauld family, to install himself among the urban poor of Paris. Until his death on 1st May 1727 he resided in the faubourg Saint-Marcel, chiefly in the rue Saint-Jacques then the rue de Bourguignon, near Saint-Médard, in the heart of Jansenist territory. Paris's asceticism gradually deepened. He refused to take communion from 1723 to 1725 and seldom left his tiny lodgings except to attend church services - though he was finally prevailed upon by the curé of St Médard, Nicolas Pommart, to take catechism classes and to train younger clergy for holy orders. Engaged on these and other charitable works, he made his way around the streets unshod, so that his bare feet became cut and bruised from the paving stones. It would be easy to presume that the diacre lived a life of solitude, but in fact his isolation was relative. His ideal was always the establishment of an informal penitential community. In the rue Saint-Jacques he lived together with five other like-minded associates. Later he shared his lodging with a particular companion, the abbé Louis-Firmin Tournus. There are other glimpses of Jansenists contacts: in 1717-19, undertaking a retreat at Boissy near Port-Royal, he was the guest of a certain Hemard d’Anjouän, a relative, and known Jansenist activist. He in fact remained very much part of the appellant network of the 1720s. He sought out news of the Jansenist cause and his various dwelling were sanctuaries for Jansenist priests and other sympathisers harassed by the police or ecclesiastical hierarchy. Though presented in the biographies as pure charity, as Christine Gouzi observes, his hospitality seems more like the action of a political agitator. This close identification, together with his charitable works, go some way towards accounting for the massive following inspired by "Monsieur François" among the working people of the Faubourg. Significantly enough his very first posthumous miracle, which took place on the day of his internment 3rd May 1727, involved a female worker in the silk industry, a devideuse de soie, whose arm had become paralysed through the arduous industrial process of preparing thread for weaving. Already physically weakened by his abstinences, the diacre Pâris's health began to give way. He undertook two short but exhausting pilgrimages in 1726 and 1727 and by April 1727 had developed a large tumour on his knee. He finally succumbed to gastrointestinal pains and was forced to take to his bed. He received the last rites on May 1st and died in agony that evening. He was just short of thirty-seven years old. [?Pierre Boyer] Vie de Mr de Pâris, diacre, "à Bruxelles chez Foppens", 1731. [Jean-Louis Barbeau de la Bruyère'] Vie de M. François de Pâris, diacre, 1731. Brian E. Strayer Suffering saints: Jansenists and convulsionnaires in France, 1640-1799 (Sussex Academic Press 2011), p.236-9. B. Robert Kreiser, "Jansenist Miracles: From the Holy Thorn to the Origins of the Cult to Francois de Paris", Chpt II of Miracles, Convulsions, and Ecclesiastical Politics in Early Eighteenth-Century Paris (Princeton University Press, 1978). Christine Gouzi, "L’image du diacre Pâris : portraits gravés et hagiographie", Chrétiens et sociétés 2005, Vol. 12, p. 29-58.